Reinhold Berndt, a German collector of prong pullers reports. "I was lucky to find two Monopol corkscrews that have been produced by the firm Monopol Usbeck & Söhne in the 1960s." 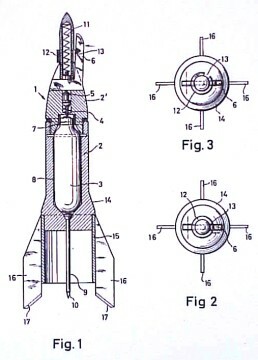 As you can see one of the rockets is a corkscrew and the other is a needle lifter. Both are very rare. 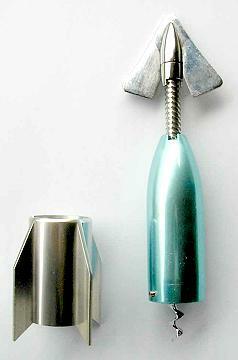 Monopol's catalog lists the needle lifter as "Bottle-opener 'Kork-Ex' drives the cork off the bottle by means of carbonic acid. 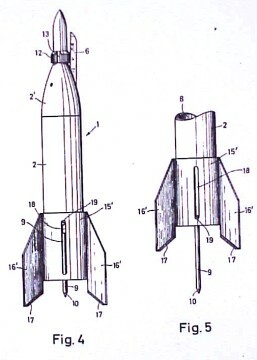 38. casing special aluminium, blue oxydized rocket-shaped with stripping-off device for the cork etc." 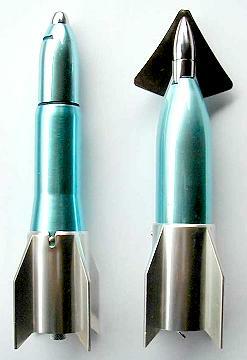 Both rockets are 7.8" tall. 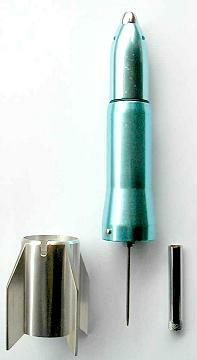 Monopolwerk Usbeck & Söhne was granted German patent 1,872,302 for the cork ejector May 16, 1963. Click here for a whole fleet!